Next fall, Greenvale resident Emily Lipari will be running track for the nationally ranked Villanova University track squad. In the meantime, Emily made her final year at Roslyn High School a memorable one. She won long distance events in Boston, Binghamton, Greensboro, NC, and Philadelphia, not to mention numerous races against local athletes. At the New York State High School Indoor Championships, Emily set a personal best in the 1500 meter run, finishing at a time of 4:28.92. 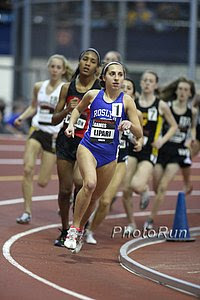 Earlier in the year, she won the Nike Indoor National Mile title, winning the race with a time of 4:46.77. Later in March, Emily won the 1500-meter Federation championship at a meet held at Cornell University. The win was the eighth Federation title in her record-breaking career. Emily won the race with a meet record time of 4:28.21. It was also Emily’s third state title, an accomplishment that has solidified her position as the finest female long distance runner in New York State. In addition to her mastery of the state tournaments, Emily has long conquered the world of Nassau County track. She is a four-time Nassau County champion in the mile run and a two-time champion in both state and county cross-country competition. Emily began her running career while only an eighth grade student. That year, she won her first All-County Award and later made the New York State Meet in the 3000 meter run. During her freshman and sophomore years, Emily’s rise to the top of the cross country field would take large leaps forward. In her freshman year, she would then take the state championship in the 3000 meters. That year, Emily would also win All-County and All-State awards. As a sophomore, Emily would become a national figure in the sport. She went undefeated in New York State cross country competition and competed in her first Foot Locker national tournament. For her efforts, Emily heads into Villanova as the top ranked woman’s mile runner in America, while being ranked in the top five in the 3000 meter category. While preparing for a soccer tournament in West Virginia, Emily took time from her busy schedule to reminisce about her time at Roslyn High School. She told The Roslyn News that her top rankings in both the mile and the 3000 meter races have not put any pressure on her as she moves toward the fast-paced world of college athletics. “I’ve learned to get used to the pressure,” she said. Emily also looked back fondly on her amazing career at Roslyn High School, praising her coaches, teammates and her older brother, Tom, who runs track at Marist University and who has long served as an inspiration for her own career. Emily praised the new track at the Roslyn High School football field, which she claimed made no small difference in her progress as a long distance runner. When Emily first enrolled at RHS as a freshman, the old red track was in place. It didn’t hinder her career, but the new blue track represents a vast improvement. “The new track is more bouncy, more spongy. It’s not as chewed up as the old one,” she said. Emily also praised the track coaching staff at RHS, plus her teammates and the student body in general. “My coaches were absolutely wonderful,” she noted. “I will definitely miss them. It will be a difficult transition going to a new coaching staff. My teammates have been like a family,” Emily added, noting also that at a recent athletics award event, the undergraduates all made humorous T-shirts for the graduating seniors. Speaking of family, Emily remains indebted to her older brother, Tom. Watching Tom’s own successful career at Roslyn High School was an inspiration for Emily, as has been his own support of his younger sister’s career. Emily chose Villanova over four other major universities. By July 1, 2009, Emily, while deciding what college to attend, was allowed to visit five universities, all offering athletic scholarships. Instead, Emily decided to visit only four: Villanova, Georgetown University, Providence University, and the University of Oregon. Oregon was the last place she visited. While she was impressed with the latter school, Emily chose Villanova, not only because of its worldwide reputation for track excellence, but also because it was close to home. This way, Emily would not lose that all-important family support while running track on the university level. The scholarship to Villanova only culminated a career full of honors. Last year, Emily’s nationwide fame was marked by a cover story that appeared in the Oct. 5, 2009 issue of Rise magazine, a publication put out by ESPN. Recently, at the Spring Sports Awards program, Emily was presented with the first-ever Roslyn High School Outstanding Athlete Award.